Lee County is a place of world class rock climbing. So attractive that the Red River Gorge Climbing Coalition, with the support from Access Fund, bought over 1,000 acres for preservation of the sport. Learn more about the RRGCC! Roctoberfest is the second weekend in October. Click HERE for information regarding the Economic Impact Study 2016 of Rock Climbing in the Red River Gorge area. Need a ride? Call Daniel Boone Transit at (606) 464-3859. The Daniel Boon Transit provides transportation to the general public. It can be for airport pickups, trips into Beattyville, transport to and from lodging areas and attractions. The fare is affordable, only $8.00 within Lee County per round trip. Other rates apply if transport is need outside of the county. A 24-hour notice is needed so plan your trip in advance. The Rock Domain open for the 2018 Climbing Season! The Rock Domain is a new rock climbing, hiking, and camping area at the Cathedral Domain in Lee County. The Rock Domain boasts over 180 professionally bolted climbing routes raging from novice (5.4 routes) to world class (5.13 routes). A central parking and information area with access to trail heads means easy access to the climbing and hiking areas. The Rock Domain is located on Highway 1746, Irvine Kentucky. Turn off Highway 52 at the Cathedral Domain sign, drive up the hill, and follow the signs to the parking area. For more information visit www.cathedraldomain.org, or call (606) 464-8258. In June 2013, The Red River Gorge Climbers’ Coalition (RRGCC) with the help from Access Fund, purchased 309 more acres in Beattyville/Lee County, Kentucky. Named the Miller Fork Recreational Preserve, the land includes several miles of cliff line, some of which has been developed but with the vast majority of it awaiting discovery and development. There is potential for more than a dozen individual crags and hundreds of high-quality routes. The Miller Fork Recreational Preserve is located just seven miles from the popular Pendergrass-Murray Recreational Preserve (PMRP) climbing destination in Lee County, Kentucky. The Miller Fork acquisition creates a brand new destination for climbers in the region, helping to relieve the access pressures and climber impacts on other crags in the Red River Gorge. “Like the PMRP, Miller Fork is going to change the game in the Red,” says Paul Vidal, President of the RRGCC. “Acquiring this property illustrates the strength of the climbing community in this region and its importance to the area. 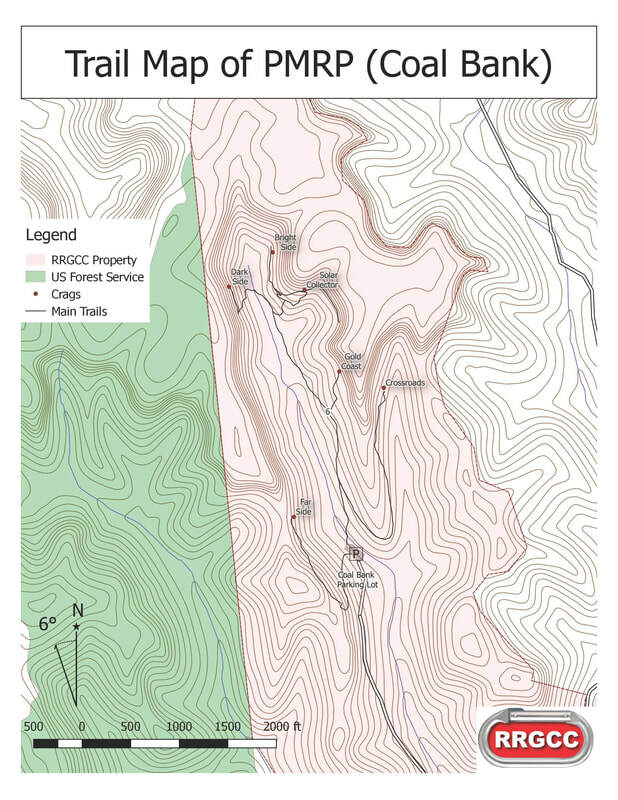 Without the community of climbers and businesses supporting us and pushing us to look to the future, we wouldn’t have been able to secure this climbing.” The purchase of the Miller Fork Recreational Preserve will be another step in securing access for climbers, while furthering the RRGCC’s mission of ensuring open, public access to ample, quality rock climbing opportunities. Like the PMRP, the RRGCC will own and manage the property in perpetuity. On January 20, 2004, the Red River Gorge Climbers Coalition purchased land in Lee County. This is a 750 acre track of land with gives private access to climbing just south of the Red River Gorge area. 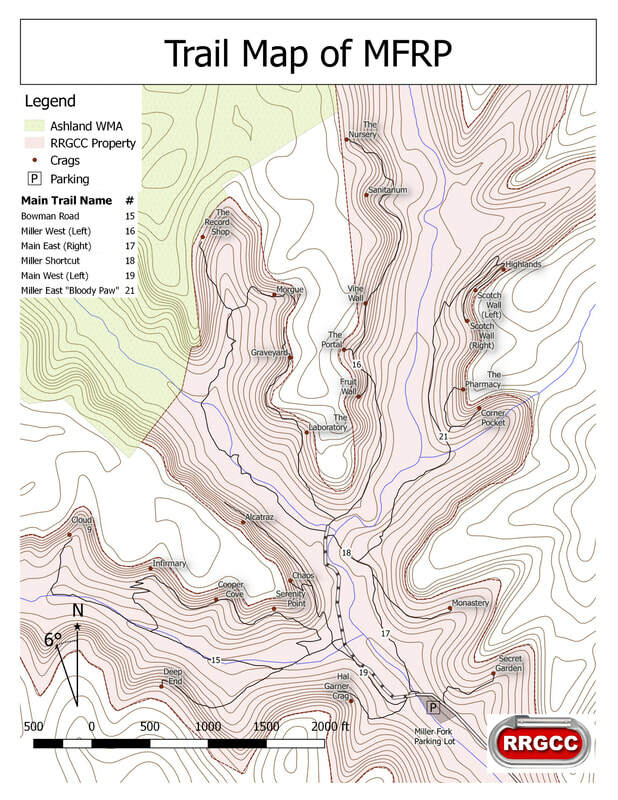 The Murray property was identified by the RRGCC as containing over 400 existing climbing routes and a number of quality cliffs to expand more routes of all difficulty levels. Since 2004, the land has been developed for public enjoyment though the creation of hiking paths, mountain bike trails, and of course more rock climbing routes. In October of 2012, the RRGCC made the final payment on the the land and it will forever remain open to climbing and other recreational activities. To get to the PMRP, travel south on KY 11 south of Torrent Falls. 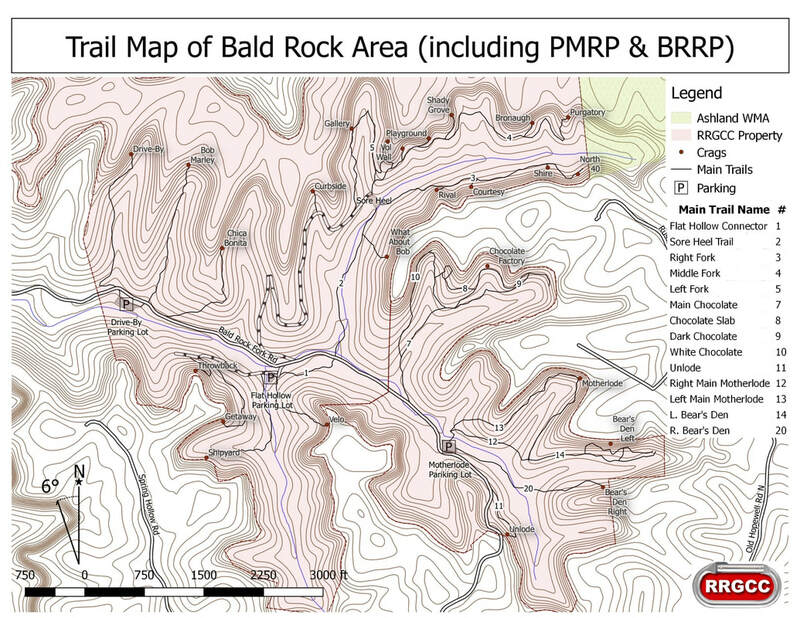 Depending on the area you're heading to, turn off on either Fixer Road to get to the Coal Bank Climbing area of the PMRP or Bald Rock Fork Road to get to the Motherlode, Bob Marley, Sore Heal, and Flat Holler locations of the PMRP. Park only in designated parking areas and steer clear of all oil production equipment. Check out the informational kiosks! NOTE: Access to many crags in the PMRP may be problematical without a high-clearance vehicle.